An easy-to-use mix for jelly-based desserts. Ideal for halo-halo and guinomis. 1. Dissolve required amount of Carte D'Or Gulaman in measured amount of boiling water. Simmer immediately with constant stirring until all crystals are dissolved. 2. Pour into molds and cool to room temperature. 3. 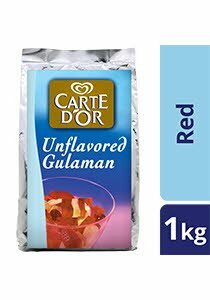 Carte D'Or Gulaman sets without refrigeration. Serve chilled for best results. 1. Quick and simple to prepare, it's perfect for busy kitchens. 2. High yield mix - excellent for cost and portion control. 3. Cost effective - high profit potential, quick to prepare versus scratch-made desserts. 4. Dissolves easily, sets quickly.